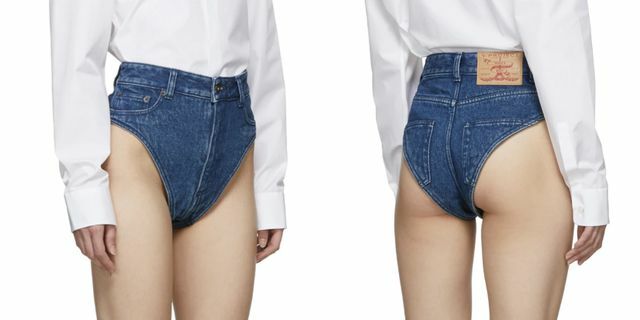 You remember sometime in 2017 when fashion brand Y/Project launched bizarre detachable short pants that became one of the fashion’s talking points? Just two years after, the Parisian label has added a new collection which is selling at $315 and Twitter users are currently spewing out their grievances. According to the product description on Ssense.com, the brief-style, mid-rise shorts comes is a navy hue, featuring three-pocket styling and belt-loops at waistband, so if you’re looking for something to show a lot of skin, this new piece of clothing is sure to rival shorts like Daisy Dukes. In the picture, a model can be seen rocking the unconventional denim pants on the runway and she seems to look cool on it — but if you’re going to get one for yourself as summer is lurking around, expect a lot of attention.